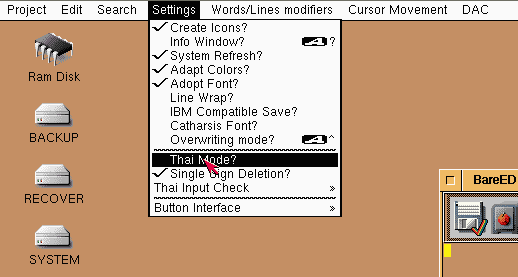 The first step you have to do is to enable the Thai mode in BareED; in advance you have already chosen a font created by Dr. Lyndon Hill, which contains the Thai glyphs. Here I cannot be of any help for you because I don't speak Thai. Let's assume you have picked "Pass Through". 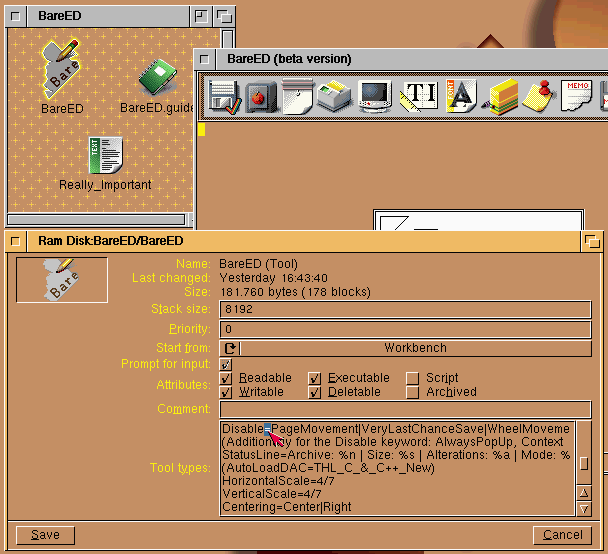 The next thing you can adjust is the method used in case the "DELETE"-key is hit. With single sign deletion, when you press DELETE *all* glyphs one cell to the left are deleted. If single sign deletion is not selected then when you press DELETE only the last typed glyph is deleted. Try both settings and you will quickly understand this behaviour. Of course, setting these characteristics each time can be a hassle, so you can also set them permanently. 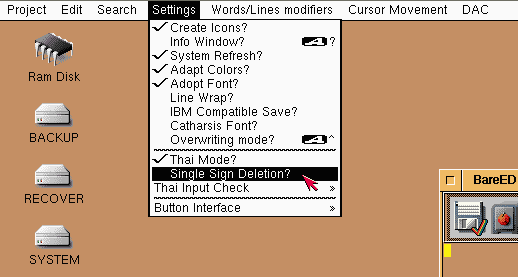 For example, using the "Disable" tooltype, you can specify "SingleSignDeletion" as argument for it, so that from now on the DELETE-key deletes complete Thai character sequences instead of only one character. 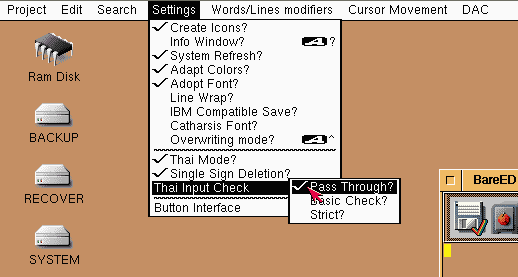 Because you want to edit Thai texts, I recommend to set some of the tooltypes below, in order to have them turned on whenever BareED is launched.